FITMENT: 2001-2005 Acura EL 2003-2005 Honda Civic 1.3L 4Cyl L(1339)(-) ONLY 2001-2005 Honda Civic 1.7L 4Cyl L(1668)(-) ONLY 2002-2004 Honda Civic 1.7L 4Cyl L(1700)(-) ONLY Package Includes: 1 x Front Right Lower Control Arm - K640287 1 x Front Left Lower Control Arm - K640288 Fits Front Lower Position Driver & Passenger Side Not what you were looking for? Search our Store Page to find the right part!. 1996-200 0 Honda Civic (all). ( Includes HI, AK, PR, and Guam ). 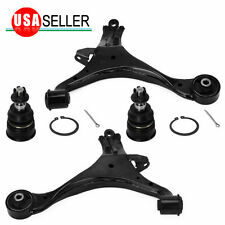 2x Lower Ball Joint - K90332. 2001 - 2005. 200 3 - 2005. All Models. Sedan & Coupe. 200 1 - 200 2. For 1994-2001 For Acura For Integra. For 1992-1995 For Civic. Increase traction to ground. For 1993-1997 For Honda DEL SOL. Prevent spring windup during breaking. 2x Trailing Arm Bushings. 1994-2001 Acura Integra. 1988-2000 Honda Civic. 1993-1997 Honda Civic Del Sol. 1997-2001 Honda CR-V. 1988-1991 Honda CRX. Warranty does not cover any related installation or re-installation costs involved. Honda Civic 1996-2000. Acura EL 1997-2000. 2 X Front Inner Tie Rod Ends TVA-EV367. 1 X Front Outer Tie Rod Ends TVA-ES3332 = ES3332RL. 1 X Front Outer Tie Rod End TVA-ES3331 = ES3331RL. Description 100% Brand new, Never been use. Color: Red Professional installation in highly recommended No instruction included Rear Lower Tie Bar: Made of High Quality T606 Aluminum Aluminum Tubing and brackets, lightweight Stainless and zinc-plated hardware Subframe Brace: Made of High Quality T6061 Aluminum Anodized Aluminum is Great for Long Life and Corrosion Resistance Super Strong Support for the Bottom Frame Increase Handling and Steering Stability Rear Lower Control Arm:. Description: Item is 100% New, Never used or installed. Made of Aluminum Alloy Color:Red Professional installation in highly recommended. No instruction included Fitment:. Fit for 2001-2005 Acura EL 2003-2005 Honda Civic 1.3L 4Cyl L (1339)(-) 2001-2005 Honda Civic 1.7L 4Cyl L (1668)(-) 2002-2004 Honda Civic 1.7L 4Cyl L (1700)(-) Features: Bushings included for a complete installation,saving time and labor. Direct replacement for a trouble-free installation. Steel,iron or aluminum construction ensures durability. Powder-coated or painted for long-lasting rust and corrosion resistance. 1990-2001 Acura Integra (all). 1988-1995 Honda Civic / De l Sol. 02-06 Acura RSX. 01-05 Honda Civic (SI Included). 96-00 Honda Civic. Anodized Red Finish. Honda CRX 1991-1988 Front Left/Right Lower. Suspension Parts Warehouse. Suspension Kits. Honda Civic 1991-1988 Front Left/Right Lower. DELPHI TC864, FIRST LINE FCA5932, HONDA 51360SK7000, HONDA 51365SH3010, HONDA 51365SH3020, HONDA 51365SK7010, LEMFORDER 3413401, MOOG HOTC1225, MOOG HOTC1991, NIPPARTS J4904010, RTS 95066252, RUVILLE 937416, SIDEM 47770, TRW JTC671. 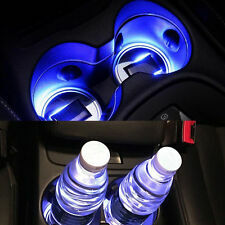 DESCRIPTION: 100% Brand New,never been use Made out of high Anodized Aluminum. The product is design for either street, Track or Drag Race. Will replace slopy old worn out camber arm for a high quality adjustable unit. Fully Adjustable to allow for the additional clearance and or Camber Correction if needed. 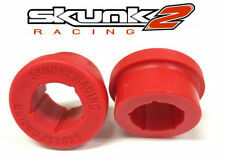 Utilizes polyeurathane bushings with steel ends. Engineered and Tested to Exceed Original Equipment Standards and Performance Professional Installation is Highly Recommended (No Instruction Included). ​ PACKAGE INCLUDES: Just as pictures shown . 2016 Honda Civic all trims. These rear lower Camber-Arms are adjustable to fine tune your cars handling in the rear. When lowering a car, these will eliminate premature tire wear caused by the rear wheels riding upon the inside tread only. 88-95 Honda Civic / 88-91 Honda CRX / 90-01 Acura Integra. Anodized Red Finish. 1996-2000 Honda Civic models. When lowering a car, these will eliminate premature tire wear caused by the front wheels riding upon the inside tread only and will allow you to tune the cornering and hangling capabilities of your vehicle during spirited driving and competition. The Honda Civic is a well-known car in the United States, and for its durability, small size, and general reliability. 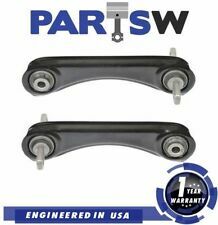 One of the major sets of parts that keep the vehicle running so smoothly on the road is its control arms, which lie on the underbody of the car. When need replacements, you can find a variety of control arms and parts for Honda Civic to get the job done. 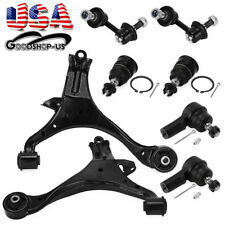 What are the uses for Honda Civic control arms? Allows movement: The control arms use a ball-in-socket part to allow the wheels to move vertically. This comes in handy when maneuvering on bumpy terrain because without these the bumps would amplify through each part and be felt in the body of the Civic. Instead, these parts are able to mitigate much of the bumpiness of potholes and irregularities in road surfaces. Interface: The control arm system allows the underbody of the Honda to directly interface with the suspension of the vehicle. The ball joint and the metal rod keep the cushioning system and body of the Honda working in tandem. Better steering: The control arm is basically flexible piece of metal with some extra functions and parts. The flexible metal part is able to keep the wheels in line with the body of the Honda, making sure that your vehicle's body and suspension stay in alignment with each other. Without these parts, everything would quickly fall out of alignment, leading to less efficient steering and driving. What parts are in a Honda Civic control arm? The essential component is the arm itself, which is a long, durable piece of metal that connects the Honda's suspension to its body. A ball joint allows for flexibility and vertical movement of the parts in order to compensate for potholes and road unevenness. The bushings ensure that the arm and ball joint are properly clamped in place. Three bushings are used in each kit. One bushing is placed around the ball-and-socket, and two other bushings are used to clamp the other end securely to the suspension. How do you know which Honda Civic parts to get? Control arms normally come in kits, meaning that the three parts used in each kit will come bundled together. To know which kits to purchase, you should check your Honda's year, model, and trim level. Furthermore, you should consult your user's manual to see if there is any extra information on the exact parts used, such as manufacturer and specifications on size. Knowing these tidbits of information will help you locate the exact part necessary for replacement.